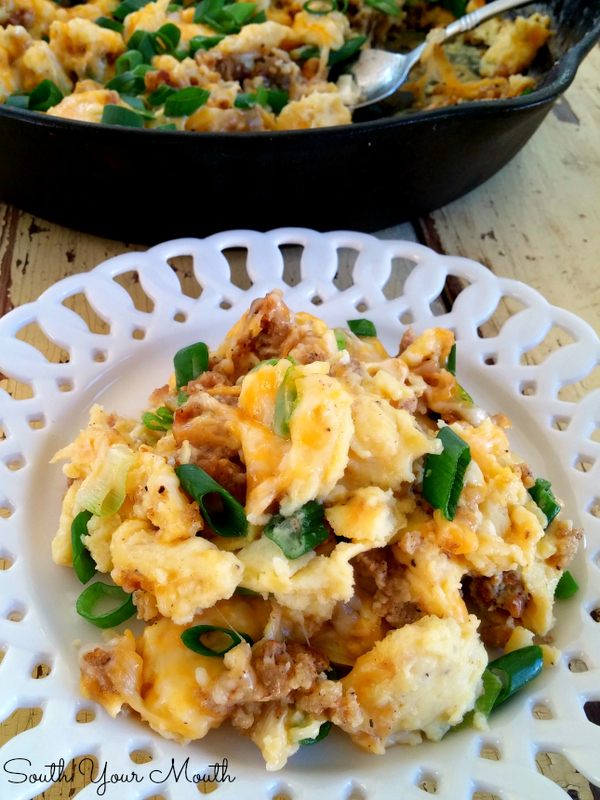 An easy low carb breakfast idea with sausage, eggs and cheese! 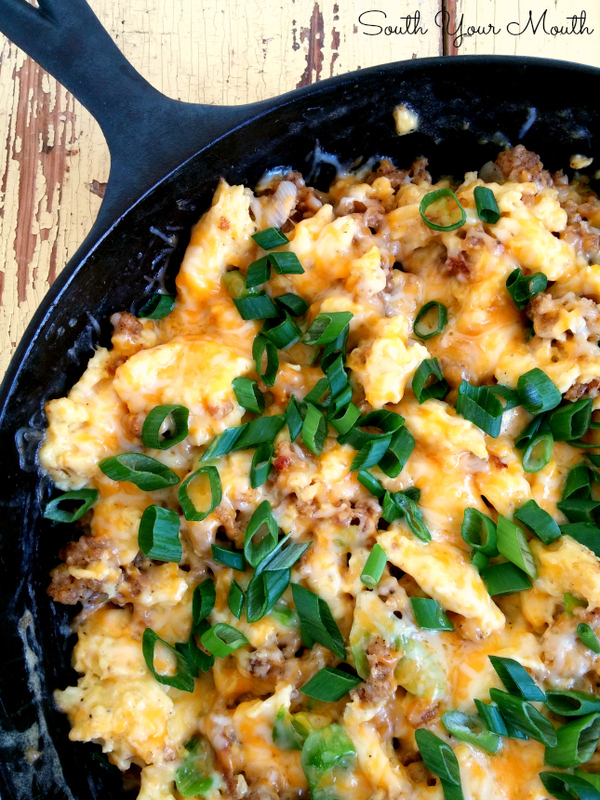 Recipe also includes variations for Mexican and Italian breakfast scrambles as well. Since I’ve been trying to watch my carbs AND eat breakfast (which has been harder than the low-carb thing since I’ve never been much of a breakfast eater) I started making this sausage scramble. I like to make it on Sunday afternoon, throw it in the fridge then heat up portions for breakfast before heading out to work during the week. It heats up beautifully! Side note about my mornings... During the summer I drive a different route to work because I don’t have to take the kids to school first. On this route is a small pasture with about a dozen pygmy goats that are always out right by the fence when I drive by. AND THEY MAKE ME SO HAPPY! I swear they come down just to see me. I mean, it is impossible to have a bad day when a dozen miniature goats run down to the road to wish you a happy morning! I’ll try to get a picture sometime soon and post it here. Providing the homeowners don’t think I’m mucking with their babies and come spear me in the back with a pitchfork. Until then, here’s a random video of pygmy goats frolicking. OK, less goats. More breakfast! This is also awesome to make when you have company because it cooks up in one pan and everyone can serve themselves! Since I started making it I’ve come up with a couple alternatives to change it up a bit! I made the original version for you here but you can also make a Mexican and Italian version too (see recipes below). If you’re not watching carbs or are serving to guests who aren’t, serve with toast, warm soft tortillas or crusty Italian bread! Cook and crumble sausage in a large skillet over medium-high heat until cooked through. Do not drain fat unless there is an overabundance. Reduce heat to medium then push sausage to one side of the skillet to make room to cook the eggs. If your skillet is too small to allow for at least half the bottom of the pan to be free for the eggs, remove half of the sausage then add back after the eggs have cooked. We want to have enough surface area in the skillet for the eggs to cook. Combine eggs, milk, salt, pepper and garlic powder in a large bowl then whisk until eggs are thoroughly scrambled. Pour egg mixture into pan then cook per your preference (I like mine super soft). 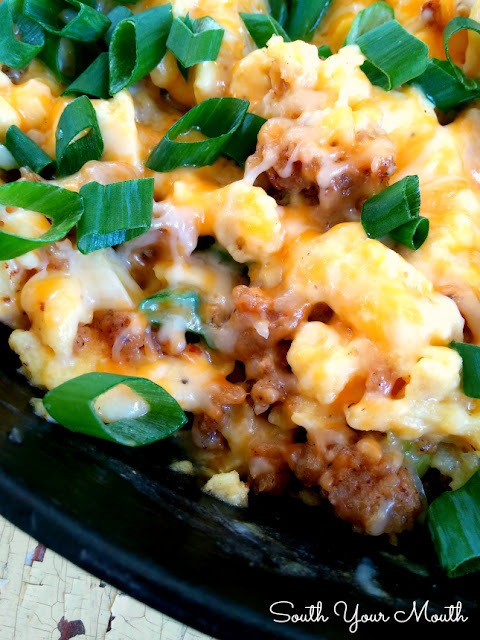 Once eggs are almost done, add 1 cup of cheese then mix eggs, cheese and sausage together. Top with remaining cheese and onions then serve. I like to have mine with fresh salsa or hot sauce! Note: I don't have the exact numbers or nutritional information but by my calculations, this has about 2.5 carbs and 32 grams of protein per serving. If you’d like a little Mexican or Italian flair, use the following ingredients; adding the additional spices to the eggs before whisking. *Mexican and Spanish chorizo are not the same thing. Mexican is (typically) uncooked and cooks up very much the same as breakfast or Italian sausage. Spanish is cured and much firmer. You technically can use Spanish chorizo but I think Mexican would be so much better in this! Ooooh I bet chorizo would be excellent in the Mexican version. I totally just added that to the recipe! WHY didn't I think of that! That's one of the things I always get at our favorite Mexican joint - huevos con chorizo! Thanks!! I also like spinach and mushroom! 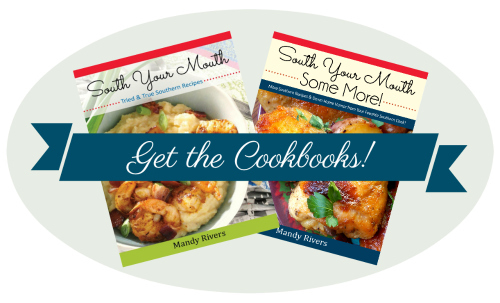 I really love that you include low carb recipes. I've had good success with a low carb diet and you are the only food blogger I follow who writes about low carb, from time to time. More low carb, please! Having a bowl, as I type! My low carb journey starts today. Looking forward to seeing more of your low carb recipes. How about adding a 4 oz. can of green chiles to the Mexican or even the original recipe? I live the LCHF lifestyle! I will try Italian Breakfast Scramble! Thanks for the recipe! Oh my god! Look delicious. Although I don't eat diet but I can make a recipe to my family. It's good recipe. Woah! Exciting post. You make me hungry now. I like use egg to make the breakfast. And I will love cheese and sausage. That a good recipe. Thank you! I will make this recipe for my sister in morning. Wow! What a amazing low carb recipe. It is easy to make but still delicious, eggs is definitely suitable for breakfast. I am not diet now but my partner is, so i will save this recipe for her. Thanks for sharing. omg it's such an amazing low carb recipe. this must be a nice suggestion for my son's ration, he's on the way lossing his weight. i forward more posts from you, my friend. enjoy your week. Are you sure this is low carb? because I can eat this all day. It's protein packed and low carb what more can I ask for? Will give your recipe a try and share my own review afterwards via http://www.trustessays.com/best-essays recipe review sections. Look great, and this make me hungry, haha. Seem easy to make, will try this. Thanks for sharing and have a nice weekend, Mandy. Looking forward to reading more. Great blog. Much thanks again. Want more. you got very interesting content here , it's very useful and helpful , I'm really appreciate for sharing !!!!! Really appreciate for your sharing ! Thanks for sharing the value post !!!!!! Have you tried substituting egg whites rather than using regular eggs?